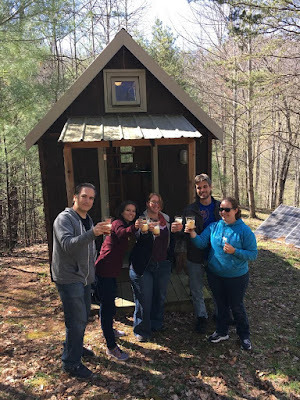 I haven't been able to write a great recap of our Tiny House Conference experience yet. Others, including Amy from The Tiny Life did a much better job. But here is what I can tell you. I love these conferences. I love being in such a huge group of like-hearted people. Even if we all come to the tiny house journey from different places, we all have the same glimmer of understanding. We all speak the same language. This year, our Tiny House Conference experience extended past the event itself. We were able to host Lina Menard of This Is The Little Life for an entire week. (If you're wondering, she stayed with us in our city house, but we did visit the tiny house.) For the most part, we just lived our lives. When work was done, we would go out and show her around town. It was a great time. Photo by Kristie Wolfe. Beer provided by Chris and Kelly. The day after the conference, when several people were heading back home, we got a call from Ethan Waldman, of TheTinyHouse.net. His flight was canceled, and could he stay with us rather than a hotel by the airport? What's especially cool about this is that while I've known Ethan online for a couple of years, the conference was the first time we ever met. And of course the answer was yes! It was really fun to have him staying with us, along with Lina, for a day. We got ice cream and took them to a favorite park. It is rare to feel that at-ease with someone you've just met, but it happens to me time and time again in the tiny house community. Unfortunately, Ethan had to leave before we went up to our tiny house. But some other tiny housers were still in town and came with us, including Chris and Kelly of Just Right Bus and Kristie Wolfe of Tiny House on the Prairie. And Lina, of course. On Saturday, April 8th we dropped Lina off at the Asheville airport and she was finally heading home. We really enjoyed the company of everyone who was able to spend time with us before, during, and after the Tiny House Conference. We'll see you all next year in Portland, Oregon! What a nice post! I love the term "like-hearted," I'm going to use it as much as I can.